Today I made mooli paratha or mooli ke parathe for breakfast. Some people enjoy them with white butter on top but we had our mooli paratha with curd. They are best enjoyed hot and crisp straight from the tava (griddle). 1. Squeeze hard the grated mooli to remove excess liquid. Set aside mooli and after you had done all the preparations including kneading the dough, squeeze hard mooli again to remove remaining liquid. 2. In a bowl, take atta and add 1/2 tsp salt to it. Add water and knead it into smooth, pliable dough. Set aside for 20 minutes. 3. Add rest of the ingredients except oil to the mooli and mix. 4. Take a small ball (peda) out of the dough and roll out into a 3 inch round putting more pressure on the outer side so that outer edges are thinner than the inner portion of the round. 5. Grease this round with an oiled spatula. Put 2 tsp stuffing in the centre. Gather the edges and reshape into a ball. Pat between your palms to flatten the ball. 6. Roll out, dusting with dry flour, into a 5-6 inch paratha. 7. Heat a tava (griddle) and place this paratha on it. Shallow fry from both sides applying oil. Fry till golden brown. Similarly make rest of the mooli ke parathe. 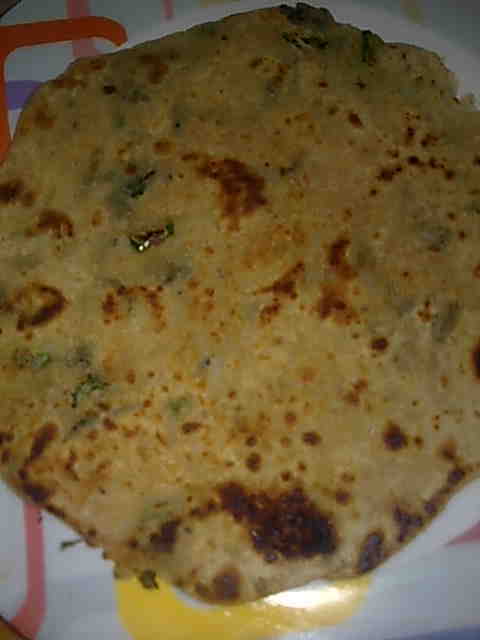 Serve hot mooli ka paratha with curd and pickle of your choice.